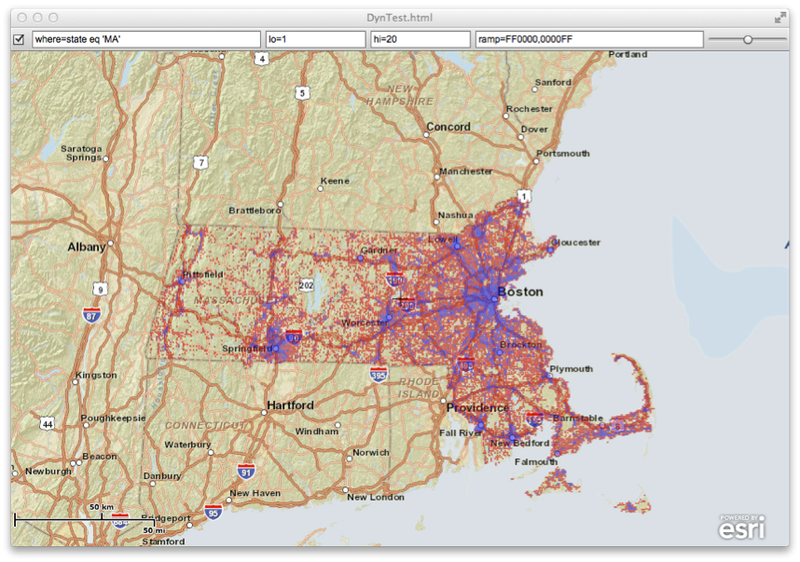 I was asked to put a Proof of Concept implementation of a very fast interactive dynamic density map generation on 11 million records for a webmap application, where a user can specify dynamically a query definition (a where clause in SQL terms), a ramp color and the service implementation will return back a density representation of the records on a map. This is typically done via a GeoProcessing task where the data is queried and stored into an intermediate FeatureClass that is further processed by a Kernel Density that produced a raster layer that is finally visualized. As you can tell, this is not interactive nor relatively fast. Since the traditional means of retrieving the data from a relational database is not fast enough and 11 million records is not such a big set after all, I decided to put the whole thing in memory. BTW, this is a meme that has been trending for while now, and the most vocal about it is SAP HANA. I decided to use Terracotta's BigMemory to hold the data in the "off-heap" and use its EHCache query capability to aggregate and fetch the data. Now despite the name, I used the cache "eternal" capabilities to forever hold the data elements. I was given the data in CSV format, so I wrote a simple CSV reader/tokenizer that bulk loads the data into BigMemory using multiple threads. The inter thread communication was handled by the LMAX disruptor, letting me focus on the loading, parsing and putting into BigMemory. The final step is the convert the aggregated features from BigMemory into an image that is returned as a response to an export Rest request. This reminded me of the days when I implemented the first version of ArcIMS in Java back in 1996/7, where I used AWT for exactly that same purpose. What is old is new again, and used the same technique to create an in memory image buffer and used the Graphics2D API to draw and color code the aggregated cells. I used the ImageIO to convert the image buffer into a PNG output stream. Now ImageIO is new and if this PoC becomes reality, I will use JAI with its GPU enhancements to do the same task. To run this PoC, I started 2 extra large Amazon EC2 instances to run BigMemory with 15GB of off heap RAM (just because I can :-) and started a medium instance to run tomcat with the Spring MVC Rest interface that communicated with two large instances. The PoC was very well received and extended it to make the layer time aware enabling the client to slide though time aware features. Like usual, you can download all the source code from here, here and here.